Come and see why year after year, groups return to Eagle Ridge Golf Club in Gilroy, CA to enjoy our great course layout, wonderful clubhouse amenities and exceptional tournament staff service. 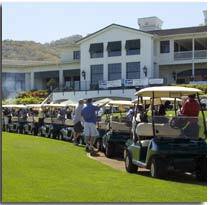 All group packages include green fees, golf carts, range balls, prize fund, scoreboard, scorecards, and cart signs. We pride ourselves in exceeding our guests' expectations, so let us add a barbecue or buffet lunch, dinner, after golf appetizers and cocktails or any other service that will make your group's day the best ever. Our Tournament Directors will coordinate all the details so you and your group can just sit back and enjoy your day at Eagle Ridge Golf Club. Group outings start at just 16 players or more. Complete our Outing Event Request Form for addtional information. Be Creative with us and Beat High Tournament Rates!